Colombia is one of the world’s main coffee producers, a significant component of its international trade. Its population is rapidly urbanizing, following the international tendency, and the countryside is gradually left behind, causing the loss of biodiversity and erosion of the agrarian landscape. Circasia is a small coffee growing town embedded in an exuberant natural context, located in the Colombian Andes. It is part of a much larger territory designated by UNESCO a World Heritage Site, as a “Coffee Cultural Landscape”. UNESCO’s designation not only protects rural and urban architecture but also includes natural features, agricultural practices and cultural assets. Circasia is not an exception to the urbanization pattern, as it is growing at 7% yearly. If the trend continues, it will double in population in only 10 years. The high growth rates reveal the necessity for new urban paradigms. 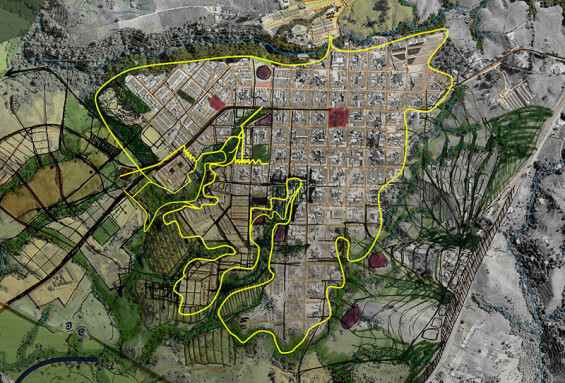 The existing urban fabric usually expands occupying both valuable agricultural and environmentally rich land, without any concern for topography, hydrology, biodiversity, or sustainability. In the south, deep creeks interrupt Circasia’s urban fabric. Circasians are aware of the environmental degradation and poor quality of the waterways in the rural hinterland impacted by untreated urban runoff that ends up in the creeks. Additionally, the poorer communities engage in a process of informal urbanization, frequently encroaching on the creeks, under risky conditions, as the settlements are prone to flooding and landslides, while increasing pollution of the streams. Inaccessibility to the creeks and the lack of “defendable eyes on these green corridors” make them crime-prone areas. In many cases the topography and the risk of flooding have contributed to maintain the land vacant and thus it is today available for creative interventions, before being occupied by unplanned informal growth. On the edges of this ravines, new development zones will help controlling informal growth serving as an interface with the larger landscape. The creeks offer the opportunity to become areas of social interaction, establishing compellingconnections with the natural systems. 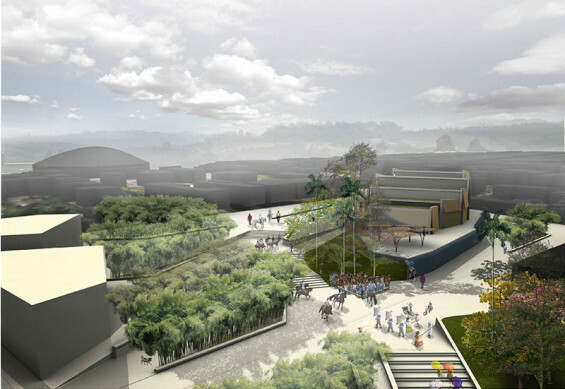 They can be used as open spaces for recreation, incorporating low impact mobility (for pedestrians and bikers), fostering habitat protection and water conservation. 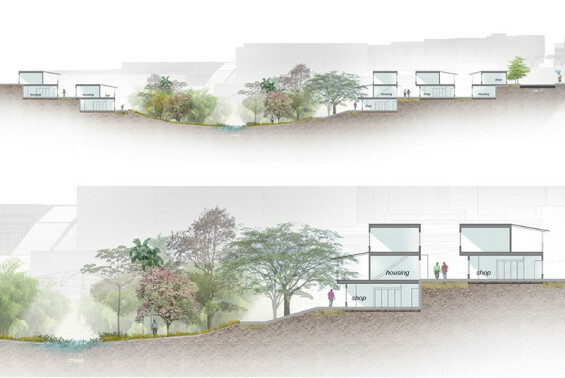 The specific design proposal focuses on how to redefine the relation of the settlements with one of the urban creeks in Circasia, allowing residents and visitors to enjoy this green corridor, creating a network of compelling public spaces and addressing environmental issues. 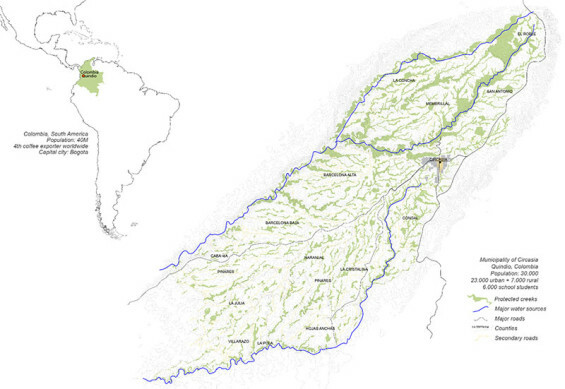 While the design solutions respond to particular local features, this case study is meant to serve as a pilot project that could be replicated in other ravines of Circasia, and in similar scenarios throughout Latin America. The gap between the urban, the rural and the natural has to be removed creating a seamless sequence of quality places. This will enhance the appreciation of the richness of the Coffee Cultural Landscape, expecting that new generations would understand the value derived from the protection and improvement of local ecosystems. In order to protect the creeks and make them part of the urban dynamics it is necessary to envision new ways to interact with them. 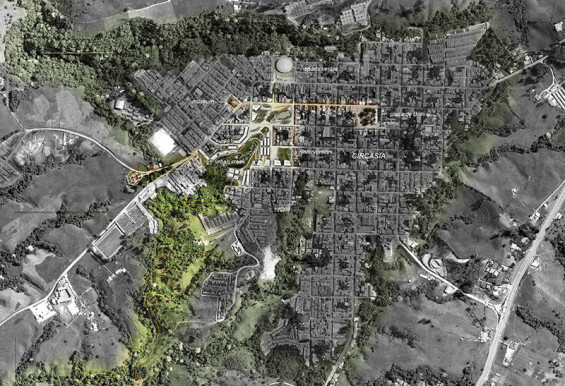 A possible approach is to carefully study the edge conditions: the seam between the city and the creeks, turning the urban fabric onto the green corridors, improving accessibility, visibility and connections across the creeks. The connections give access to incremental, self-constructed mixed-use areas, as well as to recreational open spaces. Communal facilities, civic amenities or institutions serve as stewards and activators of such spaces. 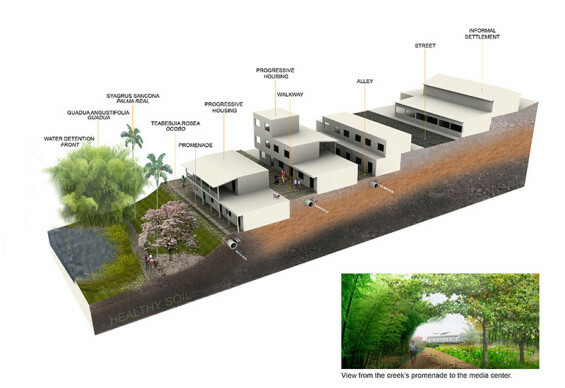 Circasia’s housing is mainly informal, low rise and self-constructed. Incremental housing is an economic way for low income families to become owners. In time, houses grow and produce an income. The owner can rent a recently built room, open a corner store to supply basics for the neighborhood or bring more family to share the house. To prevent unsafe structures, structural engineering advisory is needed to help unexperienced builders. This advisory will strengthen the community and foment a healthy habit of helping and being helped. 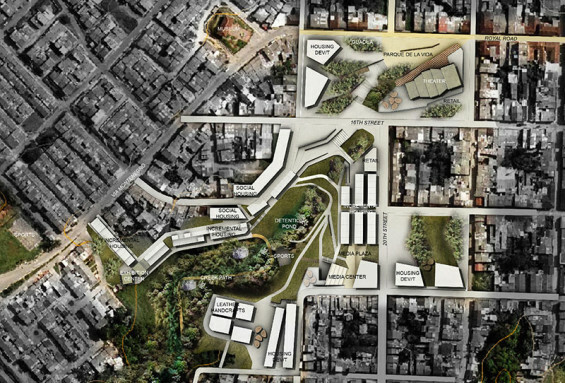 The northern area of the creek, which is today a vacant lot used to dispose of construction debris, is treated as a gateway, a large open space to be called “Parque de la vida” connected to the recently pedestrianized Camino Real (Colonial spanish Royal road) and located only three blocks away from the Plaza de Bolivar, the heart of Circasia. The park facilitates local festivities such as the “Carnaval de la Libertad” and the “Cabalgatas” (horseback riding event). This space provides access to a new theater, programed by the local government to be located in peripheral location. From this park, the creek becomes visible, accessible, appealing, didactic and beautiful. 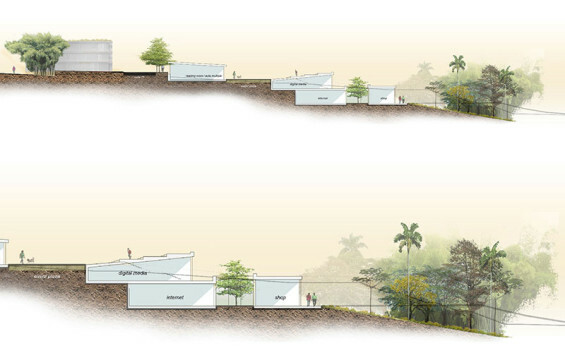 Moving down the creek, the proposal envisions a new sequence of community oriented open spaces. This planned occupation of the upper bands of the ravine, in areas free from flooding, is intended to create a healthy edge that looks into and protects the natural features. The open spaces in the ravine provide opportunities for leisure, sports, bird watching or water interaction. In the distance, the intensity of human use fades away and it is replaced by the natural processes of the primary forest and biodiversity. 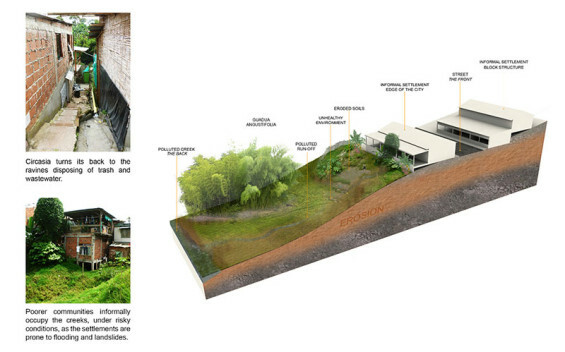 The creek becomes an interface where the urban, the rural and the natural coexist. The project was exhibited in Circasia in order to communicate the main concept to the Mayor of the town and its inhabitants. This project was awarded with the Richard Diehl Award by Vectorworks .